Telling people that I was going to use cloth diaper resulted in a lot of hilarious questions, expressions and plain old bullying! And while I get those looks frequently between my parenting choices and my food preferences, I didn’t expect it as much for diapers (though obviously I should have!). Part of the battle when telling people I planned on cloth was that there are so many misconceptions surrounding cloth diapers. And so here I am. I want to debunk some of those myths in the hope that more people may go the cloth route. Back in our parents day this statement was accurate. At that point, all cloth diapers were simple cloth and you had to insert big metal pins into the sides in order to adhere the diaper together. Talk about insane right? Now-a-days cloth diapers are beyond simple. You can still pin if you like (but uh, hello, why??) but most diapers and diaper covers are either snaps or Velcro. The diapers and covers I use are both snaps making it beyond simple to do them up (yes, even at two am in the dark). Check out the video below to see just how easy & quick it is! Umm.. I’m pretty sure that cloth diapers are not the only stinky ones! But I digress. 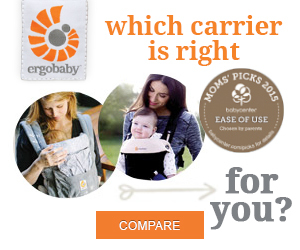 Many people think that because there are no fragrances cloth diapers smell more. However, with cloth you’ll be changing your babe more frequently and thus, baby bear won’t be as stinky. As for the diaper pail. Similar to investing in a specific garbage pail for disposable diapers, there is a better option for cloth than your regular old kitchen garbage. The pail you’ll want will be tightly sealed and have a charcoal filter to help with the smell. And like everything, baking soda and frequent changes go a long way! One way to eliminate stinkiness is to make sue the wetness from the diaper isn’t absorbing into the cover. Once baby bear starting peeing more heavily we switched our covers to the Grovia ones because they offer a mesh type one that doesn’t absorb. I’ve been in love with them ever since! Cloth diapers can be pricey to start. The cost is much more upfront than with disposable diapers. However, in the long run you’ll save money. If you’re going to use the same diapers for two or even three kids , you’ll be rolling in cash. As for me, baby bear was what I coin a “super peer” meaning she went through an alarming amount of diapers per day (upwards of thirteen to sixteen) until she was one. Insanity. If we would have spent that money on disposable, we would have been poor. 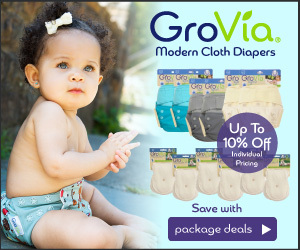 Since most people who cloth take good care of the diapers, you can normally find them on sale used as well. Search around – it’s worth it. I hear you. This is easily the biggest complaint of cloth diapers. However, if soaking, washing, scraping really freaks you out that much, check your area for a diaper service. We have a diaper service here, Cheerful Cheeks, which delivers you fresh cloth diapers weekly and picks up your used ones! No scraping or washing. All you have to do it place the dirty ones in the bucket and put them out each week )no, I wouldn’t want to be the guy who has to sort them either!). This service costs about $21/week – which is nothing in the diaper world. So regardless, there are options! Don’t forget to pin this so others fall in love with cloth diapers! Personally, for my family cloth diapering has been amazing (check out my reasons why here!). But it’s not for everyone. Take the time to learn about the ins and outs of cloth diapers before making your decision. Are you yay or nay cloth diapers? I didn’t use cloth diapers auth my son, mostly because we were traveling for abbot 10 months from the time he was 10 months old. But, I did use cloth wipes and really liked them! Yea, traveling with them is… bulky haha so I can see that. The wipes are wonderful too- and so easy! That sounds like quite the adventure! I’m definitely a “yay” on cloth diapering! We did cloth most of the time, and I loved it! Right?! Those big cloth bums are so freaking cute!